I’m a copywriter for David’s Bridal, which is based in Conshohocken, near Philly. I write marketing and advertising content (so, web pages, mini magazines, emails, etc.) about special occasion apparel and planning. On the side, I work on the College's Class News. Before this, I was a magazine editor. I was lucky to wander into it. I’ve always enjoyed writing, but I didn’t know how to (or if I even should) turn it into a career. I started freelancing for a little income while I studied for the LSAT and applied to law school. But I found myself thinking: What if I just DID this? So I deferred enrollment to try to build my portfolio, and when I got a full-time editorial job, I let the deferral expire. From magazines, I shifted to copywriting, which suits me well. It’s fast paced and creative, and I like the balance between big-picture and nitty-gritty thinking. 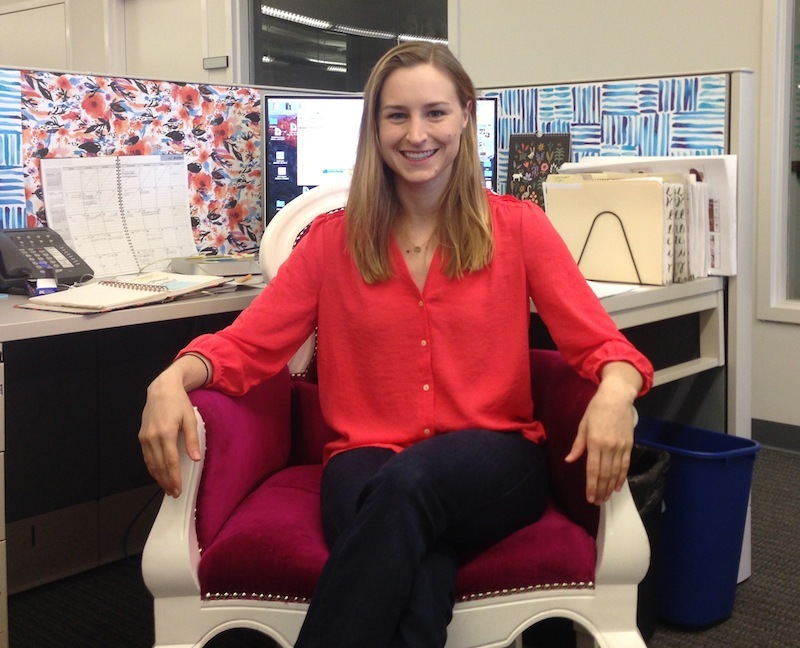 Plus, I get to sit in this pink velour throne that I co-opted from a quinceañera photo shoot. Right now, I'm focused on finishing my master's degree in professional writing this winter and working on some exciting new campaigns for David's. It's hard to say where the future will take me, because so far, it's been a bit of a winding road. But I look forward to finding out. Not going to law school. It’s a wonderful choice for many, but for me, it would’ve been just because I didn’t know what else to do, and hadn’t been willing to ask myself some tough questions. One, the Classics major (and a liberal arts education in general) was great training for fluency in different types of communication, and for mastery of vocabulary and style. Two, I think the Haverford spirit of humility and honesty, in part, has given me the courage to take risks and pursue things that aren’t fancy or lucrative, but which I feel are the right things to do. And three, several fellow alumni have helped me immensely since graduation as I sought advice and guidance in my field. I wouldn’t have found my way without them.